The BCCS is pleased to provide a library of educational programs that can be used at Regional Meetings and Shows, as well as for presenting at your local coin clubs. There are both general and series-specific programs, and can be downloaded to your local computer for tailoring and presenting. The presentations are date-stamped, so please check back from time to time for any updates, as well as newly-added presentatons. Some of these Powerpoint presentations have Speaker Notes, to supplement the slides themselves. To view the Speaker Notes, select View → Notes Page within PowerPoint. 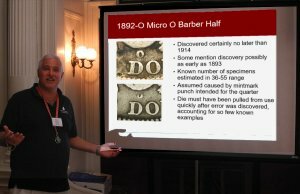 Barber Fakes - Counterfeits and altered coins - COMING SOON! If you have an educational program you would like to add to this site, or ideas for additional programs, please contact the BCCS at bccs@barbercoins.org.